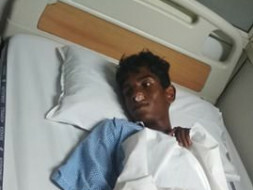 He is suffering from AML blood cancer. His parents are too poor to provide him good treatment. Please help him to get necessary treatment. Everything is going well but he needs to continue the medication. hence withdrawing money to continue the expenses. One round of chemo therapy completed. Doctors said that the second round will be started after one month if required. Situation is a hit better now. First of all, Thanks all for supporting us. Till now we get nearly 50k. Here in Yasidha, for first two day we spent 1 lakh 40 thousand. From the Third day we are spending approximately 30k. It's been 4 days since we joined him in Yasodha. According to the doctors, 1st cycle of chemotherapy started today (20th June, 2018) and lasts for 15 days. Next 2nd, 3rd cycles follow. Generally there will be 6 cycles and it will vary according to patient's condition. We will spend some of this money for chemotherapy treatment and remaining is for medicine and future treatment.